On Saturday morning I awoke feeling curiously unsettled about how to spend my day. There were the usual weekend chores to accomplish - laundry, bathrooms, a quick vacuum and dusting - but if I focus, I can accomplish that in the morning. I didn't focus. Instead, I puttered. I recently saw a photo in Canadian House and Home that featured a mass of brass candlesticks. Hmm, I thought. I have lots of brass candlesticks, somewhere. A little rummaging in the cupboard revealed a box full, somewhat tarnished. I gave them a bit of polish, and stuck them on the mantle. Away went the red dishes, in the hutch since the end of November. We used them most recently for Valentine's Day. They've been replaced by delicate, mostly floral teacups, reminiscent of the gardening season to come. An overgrown, root-bound fern has been relegated to the patio until I decide what to do with it. 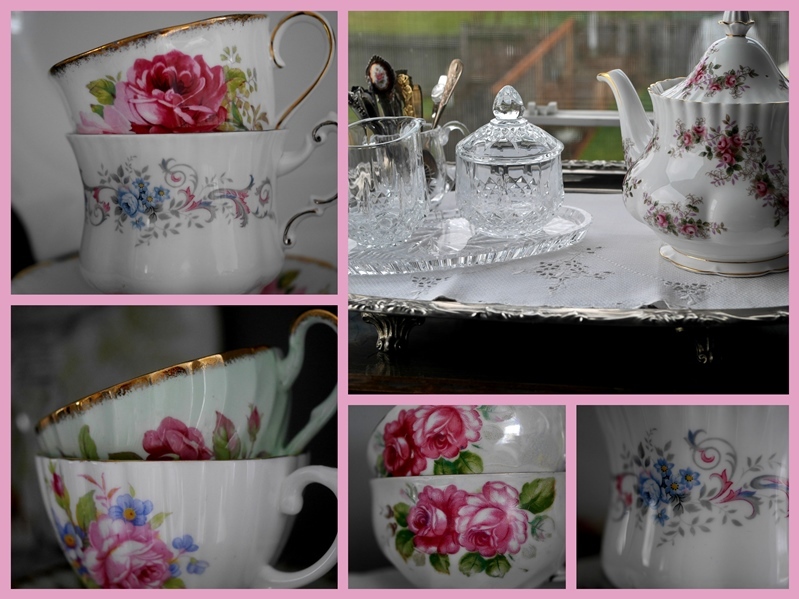 In its place I brought up the old tea cart from the basement, and set the silver tray with an embroidered cloth sent from England by Barbara of Small Moments, my china teapot, an orphaned crystal creamer holding coffee spoons, and a crystal cream and sugar set. All that remains is to make some scones, and have tea! I removed the plate gallery from the dining room wall. I've been wanting something a little more streamlined there, and haven't found what I'd like yet. But I filled and patched all the nail holes from the plates, hung a temporary picture there and quite like the simpler look. Three hyacinth bulbs bloomed over the weekend. They are on the dining room table, filling the room with wonderful fragrance. I laid the tablecloth crocheted by Tim's grandmother years ago over the wood and set the pot of hyacinths atop. By mid-afternoon, the house was clean and tidy, and felt airy. So lovely. Satisfying. In the mornings now, it's not utterly dark. The chilly air streams in through the open window and I hear early bird songs as I awaken. There's a lightness in the air and energy as the earth's northern hemisphere slowly tips towards the sun. Are you feeling it, too? Good Morning, Lorrie, loving the light refreshing spring time ambiance that you've created in your home this weekend, I may well be inspired to follow your lead today and move things around. 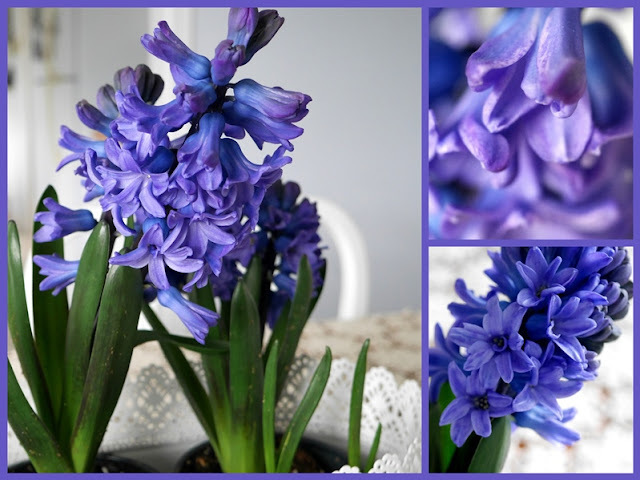 The hyacinths are wonderful, I can almost smell their fragrance. Looks so pretty & fresh indeed. Not even online dictionary told me the meaning of 'putter' but I got the meaning somehow :) I ought to do some puttering too! Have a great week Lorrie! Puttering around the house is my favorite pass time. '-) Oh, and the hyacinths - marvelous! I can smell the sweet fragrance through the screen. Sounds like a worthwhile couple of hours puttering. Loved the candlesticks grouped together and the hyacinths are a delight. What a perfect way to spend a day, and at the end of the puttering you must have felt very happy with what you had achieved. How lovely to see my sweet mother's little cloth gracing your tray. Your puttering led to very pretty placings all around your home. Your hutch is ready to welcome spring with its new floral collection, while the brass candlesticks have claimed their corner on the fireplace mantle. The periwinkle blue blooms are a fresh and fragrant finale! That looks like productive putterin Lorrie. The teacups are pretty and a good sign of nice weather to come. sometimes it is just nice to putter. You seemed to achieve a lot in that time. I love the row of candlesticks. We are still in summer, but I can understand that feeling of enjoying the warmth of the winter, or is it spring, sun seeping in. Have a wonderful week. I love how you putter! Fun post. Love the hyacinths. Have a lovely week. Happy Hyacinths! They are beautiful. Your place looks lovely. This inspires me to begin thinking about something less wintry, though truth to tell, the winter decor could continue all the way to Easter. I like your brass candleticks...will you light the candles or would it be cause for alarm? Each morning as I walk the dog I notice that the sunrise is a bit later - from week to week it is quite noticeable. Puttering - it's a lovely treat to give yourself - it implies a gift of time. I love the poufs/ottoman by your fireplace, as well your tea pretties. Today is Family Day in Ontario so I'm puttering around this morning. I've also noticed the days getting longer and like that it's still light out at the end of the work day. You have a lovely home, Lorrie. The brass candlesticks look very nice on your mantel, and thta purple hyacinth is so pretty! We have had beautiful spring like weather this whole month! Very unusual weather for mid winter here, but I'm sure spring moisture will bring the usual snowfall back again--or at least I hope so as that is how we get the moisture we need. My husband has actually had to water our shrubs and trees twice this month as it has been so dry. Your puttering produced some great photos and mosaics. Lovely tea cup mosaic. I love a day of puttering. Things usually look refreshed when I'm done, as does your new touches at your house. I like all the brass --maybe I should collect all of mine and see what the mantle looks like. We are enjoying brighter mornings but soon our time change will change that ---but then dusk will come later. Yes, it hit my yesterday. I love your thoughts on moving some springtime into the house. I am strolling through my house yesterday and today trying to figure out how to add light and airy and flowers. You are inspiring me to continue the quest. I'm not sure my puttering has as attractive results as yours obviously does, but I know I love it just as much, crave it quite desperately sometimes as a way of clearing the path to a destination I can't even discern at the outset. . .
Oh yes we are feeling it too. I have to remind myself it is only February. BUt we'll take the occasional warm days anytime> I Love the smell of hyacinth. The brass candlesticks look great (and reminds me of one of my dear mothers sayings 'everything old is new again'). I subscribe to our monthly NZ House and Garden mag and pick up lots of ideas, as well as interesting recipes to try. Your house looks beautiful in these photos Lorrie. So neat and calming. It's nice to putter. I think I was doing the same thing all weekend as my dad went into hospital and I couldn't focus on something big. Little jobs around the house did the trick. I am feeling it too, Lorrie. I'm naturally a winter lover and even more so after a long hot fall in FL but even I feel an excitement when I've been opening up the kitchen door first thing in the morning to go out with the dogs and I feel spring all around me. Your new mantel arrangement is lovely. And reminds me that my future daughter-in-law just asked me to keep an eye out in thrift stores for brass candlesticks as she wants to use them on tables at the wedding in early September. After seeing yours I know exactly what to look for now. Oh those hyacinths, I do so love their scent. And I love puttering too. It's very restorative, isn't it? Not like work at all. A lovely post your photographs are great. Those hyacinths, such a gorgeous colour. Yes, feeling it too Lorrie! I loved this post...the satisfaction of 'puttering' is a joyful thing. Your pictures of those little changes and arrangements are lovely. It is so nice to be inspired to use things you already have but in a new way and to enjoy them afresh. How utterly lovely. Love the brass candlesticks. I have a number of those, a few of them live on my mantel along with a few other decorative candlesticks. And the thought of the scent of that hyacinth, along with its brilliant color, makes me wish for some of my own. And that china is just gorgeous... what artistry in those blossoms. Thank you, as usual, for the lovely images. I love puttering. And hyacinths. Looks like a fun day to me and you certainly got a lot done. I so can relate to you, Lorrie, as one of my favorite things is puttering around my home. Your grouping of brass candlesticks looks so pretty on your mantle. I'm loving those cozy looking ottomans in front of the fireplace, too. How I love the look of your hutch and tea cart with the fresh, Springy look. I hope you enjoyed some tea and scones! I think you accomplished much in your puttery morning . . . perhaps even more than if you had had a focused plan. Sometimes you just need to follow your whims! And now your house is waiting for glorious spring! I love all your springy touches and especially your pretty china. Its fun to change up the decor with each season. Does wonders for the mind and soul I think. I haven't opened a window here yet but was tempted yesterday. I like the candlesticks together as a collection Lorrie.